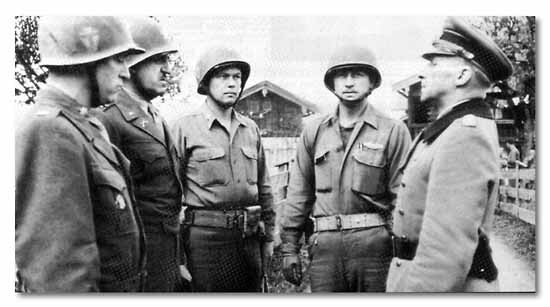 Colonel John J. Albright, Commanding Officer of 143rd, with Battalion Commanders, receives surrender of enemy XIII Corps. Inevitably the day-to-day headlines in late April and early May foretold what was coming: Berlin Falls; Munich Taken; Mussolini Executed; Himmler Makes Capitulation Move; Adolph Hitler Dies; Germans in Italy Surrender. The 36th was driving deeper into the narrow Alpine valleys of Austria and Southern Germany. Soon the battered, straggling groups of Germans falling back before them would have no place to go but the snowy crags of lofty mountain ranges. On May 5 at 1830 hours came the message from Seventh Army Headquarters that signaled the end of hostilities, "German Army Group 'G' has surrendered, effective 1200B 06 May 1945. All units halt in place. Do not fire unless fired upon." Excited doughboys, unable to control repressed enthusiasm and relief, fired M-1's into the air. That night German emissaries contacted both the 141st and 142nd Infantry commanders. Arrangements for the carrying out of the surrender terms, prolonged over another two days, were complicated by the dispersion of German troops and lack of communications resulting from their hasty retreat. Many stray fanatical SS groups roved the hills out of touch with any command. In carrying out surrender, Germans stacked arms at points designated by local allied commanders. 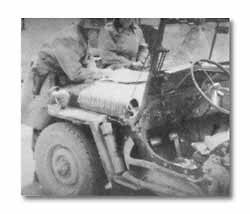 The Germans assembled at selected places as directed, stacked their arms, ammunition and motor transport. 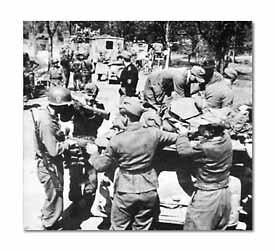 On May 8, in a day-long convoy, T-Patchmen streamed in to accept and control the surrender and to occupy St. Johann, Kitzbuhel; and Mittersill, in the heartland of a tourist's paradise. The same day simultaneous announcements from Washington and London proclaimed the final surrender of all German forces. There in the Austrian Tyrol the 36th realized the victory it had fought so long to achieve. Last Play. Colonel Lynch, 142nd Commanding Officer, and General Dahlquist check situation during last day's fighting in the Inn River valley. Last shot. 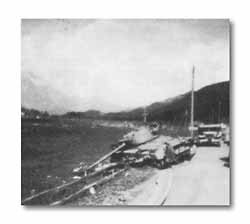 Even as news of surrender came, German 88 fire disabled this tank. Division was told to stop. 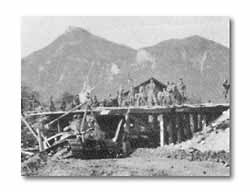 Last Span: Engineers opened the road to Kufstein with speedy timber-trestle construction after Germans had blown bridge. 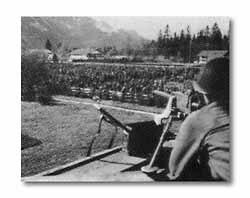 Last Roundup: Thousands of prisoners were guarded by the 141st in Division pen at Rottach.